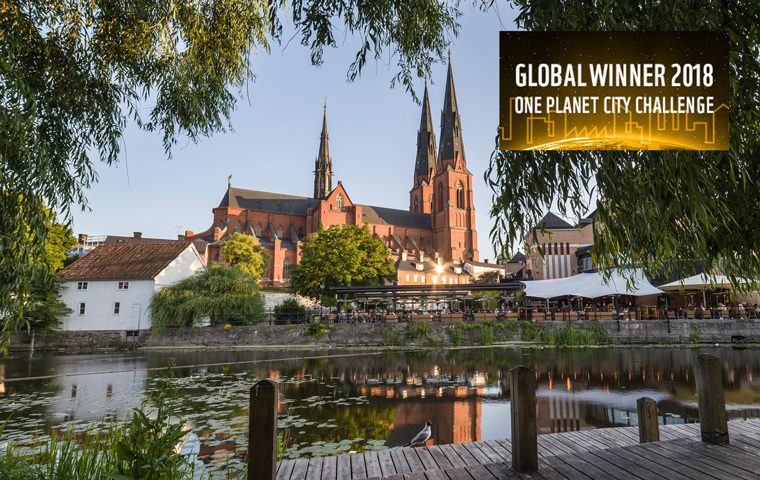 The Swedish City of Uppsala was named global winner of WWF’s 2018 One Planet City Challenge. 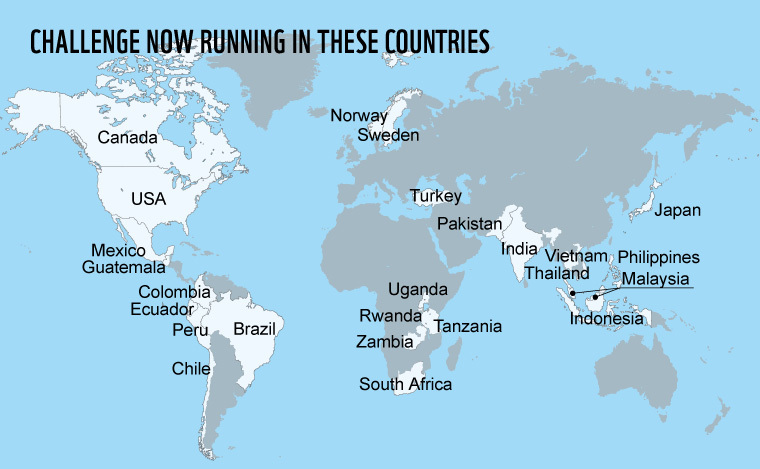 This year, 132 cities representing 23 countries participated in the Challenge. Jakarta, Indonesia was given a special mention for its work in the We Love Cities campaign, which supports participants of the One Planet City Challenge, through citizen engagement. Uppsala impressed the jury with its strong, all-around performance in key competition categories. In particular, the jury appreciated Uppsala’s sophisticated cross-sector sustainability interventions, as well as its strong leadership in the surrounding region.The global winner as well as 21 national winners and the We Love Cities campaign winner, was announced on September 12, during the Global Climate Action Summit in San Francisco. Read more. 50 finalists, representing 100 million citizens from 5 continents, took part of the We Love Cities campaign to engage citizens in expressing support for their cities, as well as sharing ideas for improvement. Simultaneously, an international expert jury reviewed all finalist cities, selecting both national and a global winner of One Planet City Challenge 2018. In cities, everything is closely connected. As cities and urban populations expand across the globe, the problems in cities also tend to multiply. The good news is that solutions can also multiply. And fortunately, solutions already exist today that have the potential to meet the demands of urban lifestyles, without exhausting the planet’s ecological capacity. So WWF created the One Planet City Challenge (OPCC) to highlight these solutions, and to recognize and reward cities that are busy putting them to use. These are cities that aim to provide sustainable housing, transportation, and energy for their residents while simultaneously engaging their citizens and acting as inspirational role models for other cities around the globe. 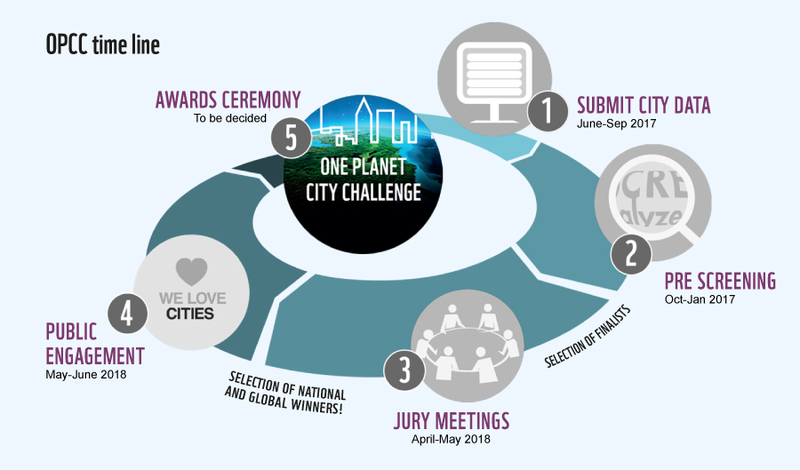 The One Planet City Challenge invities cities in participating countries to report ambitious and innovative climate actions, and to demonstrate how they are delivering on the 2015 Paris Agreement on climate change. Data is entered on the carbonn® Climate Registry, and outreach and support is provided to cities in collaboration with ICLEI – Local Governments for Sustainability. Final plans and data are then reviewed by an international jury of experts tasked with identifying the most outstanding cities. After a process involving a thorough scrutiny of submissions and jury deliberations, national and global winners are selected and awarded at a global prize ceremony. Since the inception of the Challenge in 2011, WWF has engaged over 400 cities across 5 continents. In the 2017-2018 round the City Challenge had a thematic focus on sustainable transport and mobility as a major challenge facing cities everywhere. For more info, please contact us at opcc@wwf.se. Cities are invited to report relevant data, plans and actions via the world's leading carbon reporting platform for local governments and regions, carbonn® Climate Registry, cCR, managed by ICLEI – Local Governments for Sustainability. Outreach and support to cities is provided in collaboration with ICLEI and the final plans and data are reviewed by an international jury. Cities wishing to participate in the One Planet Ctiy Challenge need to create an account in the cCR; there they can also register for the 2017-2018 OPCC. The city will be recognized as a “cCR Registered City” as long as data is reported in the Profile section. By registering for the OPCC, the city will also be counted as an OPCC participating city. Once the city has met the minimum reporting criteria, it will be recognized as an OPCC candidate city. More information can be found at: http://carbonn.org/join/. 1. The city registers on cCR and agrees to the cCR Terms and Conditions. 3. The city downloads the reporting sheets that will be pre-populated with previously reported data, if the city has formerly participated in the OPCC. 4. The city submits its completed cCR reporting sheets, with all required information, to the Bonn Center for Local Climate Action and Reporting (email to carbonn@iclei.org) before 29 September 2017 – the closing date for OPCC candidate cities. Before the final deadline, cities can also benefit from up to 2 rounds of feedback to improve their chances, by reporting before 15 June 2017. Cities reporting before 12 August 2017 can access one round of feedback. An international jury of urban sustainability experts will look for cities that demonstrate inspiring, ambitious and credible climate agendas that reflect how cities contribute to meeting the Paris Agreement goals. Joining the coalition of cities committed to the Compact of Mayors, and the Global Covenant of Mayors for Climate and Energy – as well as following up these commitments with action – will be considered a positive attribute in the evaluation procedure. Higher ambitions and the impact of corresponding action plans will be particularly favored. The thematic focus for this year’s One Planet City Challenge is sustainable transport, and the jury will be paying special attention to cities that present ambitious mobility plans and actions. The One Planet City Challenge jury is comprised of leading experts within the field of urban sustainablity from around the globe. 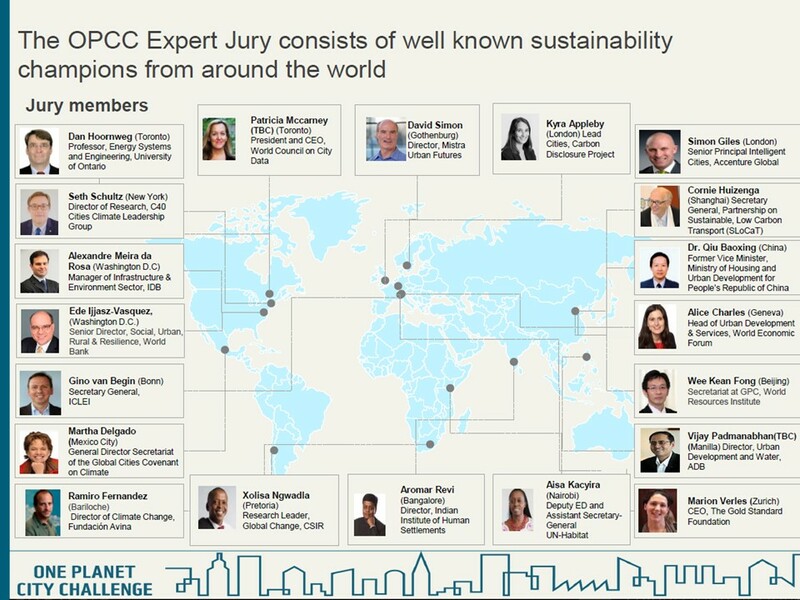 With extensive local and regional knowledge jury members are uniquely qualified to evaluate the contribution of participating cities in achieving the goals set forth in the 2015 Paris Agreement.